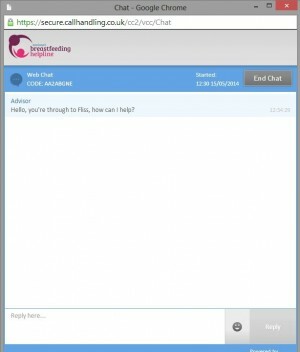 The National Breastfeeding Helpline offers a web chat breastfeeding support service for mums and their supporters in the UK. 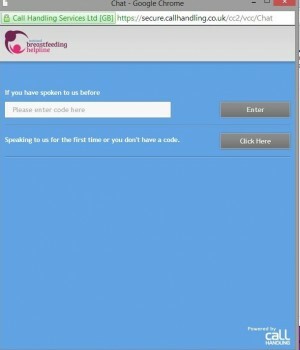 This is perfect if you prefer not to access breastfeeding support via phone or drop in group. 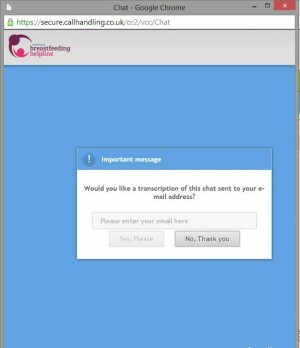 It is a confidential one-to-one secure online chat with a trained breastfeeding supporter. It works like instant messaging – it’s just typing, there are no webcams, and the only people who can see the chat are you and the volunteer supporter. If you see this sign we are available to chat. Click on the ‘chat’ sign at the bottom of the page to begin a conversation. At the moment we do not have set opening hours for web chat, it depends when volunteers are available. If the sign says ‘chat’ but you are not connected to a volunteer in less than a minute, it means the volunteers are busy on other chats. Please try again later or call the Helpline. Before you start the web chat please ensure you have a reliable internet connection. Mobile phone signals can vary and if you move around during your chat and lose signal, the chat will be disconnected. When you click on the ‘chat’ button, a new pop up window will open. If you have been given a reference number from a previous chat, you can enter it in the box that says ‘reference number’. This means the volunteer you chat to will be able to see your previous conversations. If you haven’t chatted to us before, you don’t have a reference number, or you don’t want the volunteer to see previous conversations, no need to enter anything in the box. When the new window appears you’ll see a message that says ‘please wait while an agent responds to your chat request’. If a volunteer is available to chat, she will greet you and her message will appear in your window. You can tell when the volunteer is typing by the small icon on the bottom left hand side showing a pen writing on a notepad. The text won’t be displayed as we type but only when we’ve completed a sentence or paragraph. Once the volunteer’s message appears, it’s your turn to reply. Simply click in the box at the bottom and start typing. The volunteer won’t see your message until you press enter or click on the ‘send’ button. Sometimes if the volunteer has a lot to say, it might take a while for her message to appear. Please don’t close the window while we’re typing or you might miss out on some important information. Our volunteers will make it very clear when they are ending a chat. All chats are completely secure and confidential between yourself and the volunteer. How does live chat differ from calling the Helpline? The volunteers who answer on live chat also answer calls on the phone helpline. You will receive the same independent, non-judgemental, mother centred support and information that you would on the phone helpline. If the volunteer (or you) feels it would be more appropriate to talk things through on the phone, she may suggest this. You can refuse this and no one will call you without you explicitly giving your permission and your phone number. Can I save the conversation to refer back to later or print out? At the end of the conversation, before you close the pop up window, you will be asked if you want to receive an email transcript of the call. Simply enter your email address in the box provided and a transcript will be sent directly to you. We won’t use this email address for anything else.